Cinthol Deo Stick Aura - Is it Good? Home ReviewsBeauty Cinthol Deo Stick Aura – Is it Good? Cinthol Deo Stick Aura – Is it Good? Who is it for? 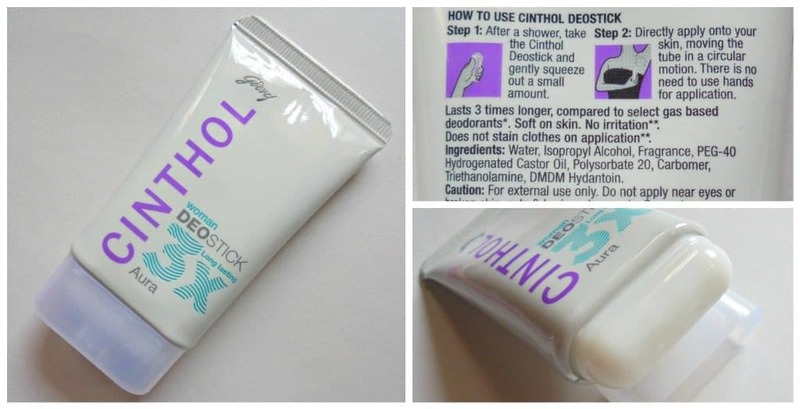 Cinthol Deo Stick Aura is a great substitute for traditional roll-on type deodorants. This budget-friendly deo stick is for those who want a floral scented underarm deodorant for counteracting body odor. How to use– This deodorant is advised to be applied after a shower. First, take out a small amount of product by squeezing the tube. Directly apply with the applicator head of the deostick; no need to use fingers. I haven’t experienced any irritation but it contains alcohol so might cause sensitivity to some. Packaging- This deodorant comes in a tube. The product comes out through a slit. The opening is covered with a translucent plastic click-shut cap. The head of the deo stick is shaped as an applicator. Colour & Texture- It is a white colored cream. The cream is lightweight. Only a small amount is needed for each application. Once the cream is spread on the skin it takes not more than 15-20 seconds to set a comfortable finish. Fragrance- The Aura variant has floral fragrance. Its top note has a slight aqua touch to it but that goes away within seconds and the floral notes take over. The fragrance has a subtle freshness to it. It has an elegant femininity as well. The smell does not feel over the top. Experience- This deodorant stick is quite effective. It keeps the sweaty smell away for at least 5-6 hours for me. After 2 hours the intensity starts to reduce but it stays on for the next few hours. I sweat a lot and for me, it works better than Sure roll-ons. Plus, it does not feel uncomfortable and heavy. It does not stain the clothes. I am using these deo sticks continuously for 3-4 weeks now. I don’t have underarm darkness problem as such and during these days I haven’t experienced underarm darkening. Yes. I would definitely recommend this to someone who wants a cheap but effective deodorant with the soothing floral smell. Loreal Kajal Magique Bold – Is it a Good Buy ? Love the way you explained about the product.. also, if it’s not alcohol free, it is of concern..
Yeah.. It should have been alcohol free..